We’re happy to announce a new feature in RM today, the Job Overview. 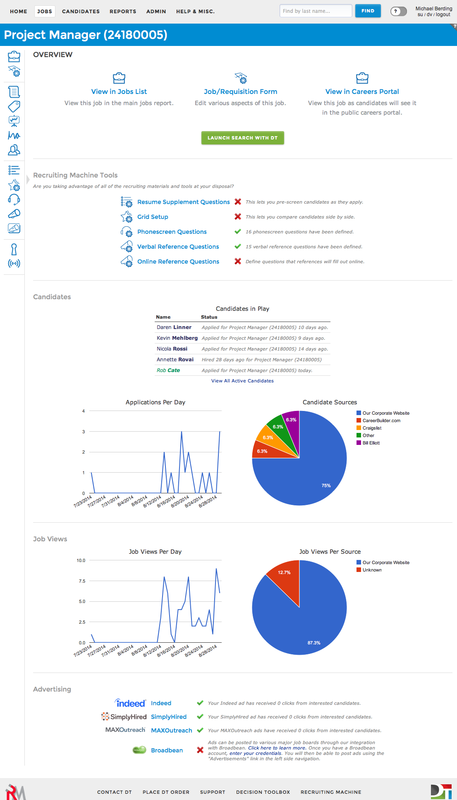 This page will show you at a glance the RM tools status, top candidates in play, candidate sources, candidate flow rate, job view rate and top sources of job views. It’s a nice way to see how your job is doing and where focus might be needed. Important: When clicking on a job number or a job name from the main jobs list, RM will start going to this overview page by default as of September 5th. You can easily get to your job-edit page or view the writeup as you have traditionally done via large buttons near the top of this overview page. There is also a setting to change RM’s default behavior so that you can choose to go to the overview page or the traditional job-edit or writeup-view pages if you desire.